“Alternative facts” is the perfect euphemism for the age of Trump. 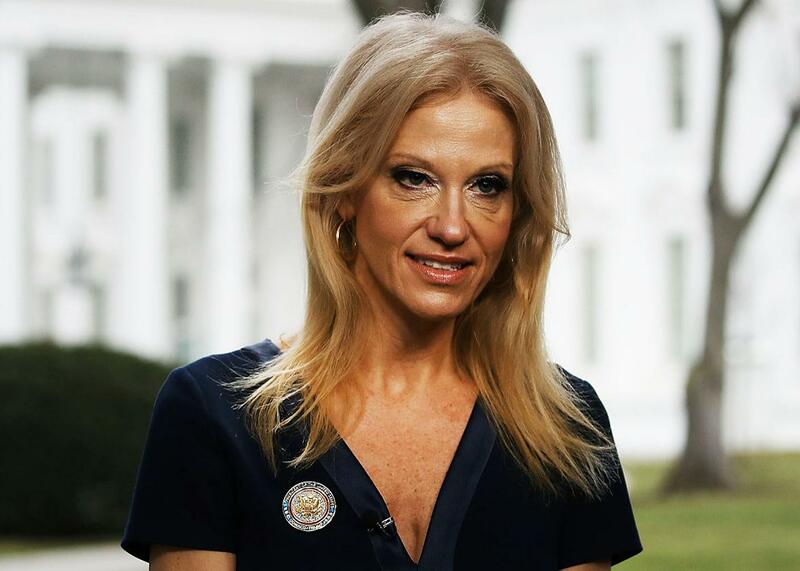 Counselor to President Donald Trump Kellyanne Conway before appearing on Meet the Press, from the north lawn at the White House on Sunday in Washington. Conway likely meant that Spicer was offering other facts—new data that would complicate the Trump’s-crowd-was-teeny-tiny picture the press was painting. In reality, Spicer—who gave out bogus stats on Metro ridership and claimed falsely that the 2017 inauguration was the first to feature floor coverings—was voicing alternatives to facts. That is, fictions. Or: lies. Todd is not the only journalist to shy away from calling a lie a lie. (Last year, the Washington Post outlined some of the reasons reporters avoid the l word.) His euphemism, falsehood, doesn’t presume the intent to deceive. It graciously leaves open the possibility that Spicer was just misinformed or mistaken. But this tactic has resulted in a bitter sort of irony: Eager to demonstrate how fair, sober, and truthful his journalism is, Todd wound up obfuscating the truth—that the White House concocted a series of fibs designed to make Trump seem more popular than he is. In this context, is it really any better to call Spicer’s sputterings falsehoods rather than alternative facts? It’s undeniable, though, that alternative facts is an amazing coinage—the label this deeply stupid episode deserves. For one thing, the phrase calls to mind the snake-oil salesmanship that has animated Trump’s rise to power. The term alternative medicine arose in 1974 to describe unorthodox or scientifically unproven methods of healing and care. As Alan Levinovitz notes, the word alternative often serves to “collapse epistemologies”—to destabilize the foundations of our knowledge and make us feel that traditional sources of information cannot be trusted. The modifier’s connotation of gutsy, even glamorous independence also lends credibility to the rogue alt-right, which represents a large and terrifying swath of Trump’s support. Har har. The Orwellian reality, however, is that the White House’s prevarications aren’t just bad information. They may well be theatrically, obviously bad information dumps—in other words, politically motivated attempts to provoke us into spasms of righteous fact-checking. It’s hard to pay attention to the millions of protestors across the world uniting against Trump when you are gazing, gobsmacked, from 2009 photo to 2017 photo and back again, wondering how anyone could possibly maintain that the latter crowds dwarfed the former. On Monday, Spicer returned to the fray with a white flag of sorts, acknowledging that the Metro ridership numbers he’d referred to over the weekend (obtained by “an outside agency,” he clarified) “were different” from the correct ones Metro had recorded. “That wasn’t like we made them up out of thin air,” Spicer said. Perhaps it’s encouraging that the White House was willing to walk back a particularly egregious howler, although I’m not sure Spicer would have relented if there was any possibility he’d get away with the deception. “I believe we have to be honest,” Spicer added, conjuring the riddle in which the liar answers questions about whether or not he is a liar. “I think sometimes we can disagree with the facts. Our intention is never to lie to you.” Intentions, huh? The road to an alternative to heaven is paved with Sean Spicer’s intentions.